No, this isn’t a scene from the 1992 film "Sister Act" - it’s Gauguin’s depiction of Breton women experiencing a shared vision of Jacob wrestling an angel from Genesis 32:22-32. Obviously. 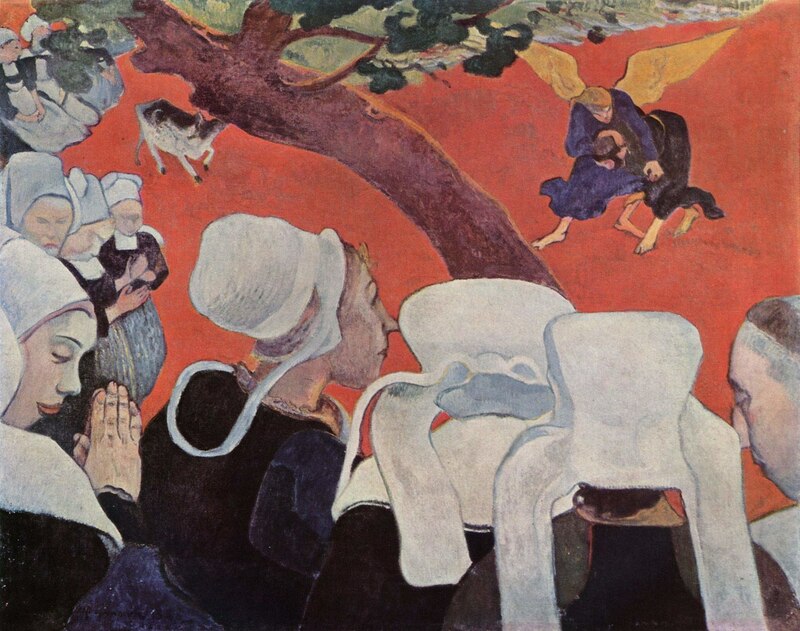 After befriending painter Émile Bernard in Pont-Aven, Brittany, France and seeing his painting Breton Women in the Meadow, Gauguin wanted to do his own take on Pont-Aven’s religious festivities. Both were interested in overturning Impressionism through cloisonnism (strong outlines, bold colors), synthetism (two-dimensionality), and symbolism. Gauguin’s successful execution of all three styles in one painting makes this one of his most famous artworks, though Gauguin himself admitted the picture was badly executed. Even the Church of Pont-Aven refused to accept the painting as a gift. Vision After the Sermon gives new meaning to the phrase “seeing red.” The vermilion background symbolizes the imagined world of the vision contrasted with the monochromatic reality in the foreground. The red was also a nod to the reddish seaweed Pont-Aven farmers spread on the fields to dry and use as fodder. Red backgrounds were a typical characteristic of medieval stained-glass, Epinal prints (popular French comics), and Japanese decorative prints. This painting of French women experiencing a Biblically-inspired vision was heavily inspired by Japanese artwork. The downward perspective and diagonal positioning of the apple tree mimics the style of Japanese woodcuts, particularly those by Utagawa (Ando) Hiroshige. We can also see Japanese influence in the wrestling technique Jacob uses on the angel, inspired by Hokusai’s prints of sumo wrestlers. Weirdly enough, wrestling was a popular event at the Pont-Aven Pardon, an annual festival based on religious pilgrimage (hence the nun costumes). It was common for Breton boys to engage in wrestling after Sunday mass and, as a result, Breton became associated with wrestling. Who needs WWE when you can live in 19th century Breton instead? The story of Jacob and the angel goes like this: After sending his family away, Jacob wrestles with a “man” and refuses to let go, even after his hip breaks, and the “man” blesses Jacob because he’s overcome his struggles. Gauguin may have chosen this story specifically to represent his own creative struggle as an artist. He possibly even painted himself in Vision as the priest on the far right with his characteristic angular nose. Since Gauguin wasn’t religious, the forty-year-old likely wanted to one-up Bernard, a young painter with intimidating potential. Gauguin also had the hots for Bernard’s teen sister Madeleine, a devout Catholic, and tried to woo her by painting religious subject matter. Bernard wasn’t pleased about Gauguin’s infatuation with his baby sis or when his friend Albert Aurier, an esteemed art critic, praised Gauguin for inventing symbolism when he had clearly been inspired by Bernard. Once again we see Gauguin do what he does best: piss people off. Dorra, Henri. Symbolist Art Theories: A Critical Anthology. University of California Press, 1994. Druick, Douglas W. Van Gogh and Gauguin: The Studio of the South. Art Institute of Chicago, 2001. Goldwater, Robert. Paul Gauguin. Harry N. Abrams, Inc. Publishers, 2004. Harrison, Charles, and Frascina, Frances, and Perry, Gillian. Primitivism, Cubism, Abstraction. Yale University Press, 1993. Orton, Fred, and , Griselda. Avant-Gardes and Partisans Reviewed. Manchester University Press, 1996. Silverman, Deborah. Van Gogh and Gauguin: The Search for Sacred Art. Macmillan, 2004. Sweetman, David. Paul Gauguin: A Life. Simon and Schuster, 1995. Vision after the Sermon (Jacob Wrestling with the Angel) is an oil painting by French artist Paul Gauguin, completed in 1888. It is now in the National Gallery of Scotland, Edinburgh. It depicts a scene from the Bible in which Jacob wrestles an angel. It depicts this indirectly, through a vision that the women depicted see after a sermon in church. It was painted in Pont-Aven, Brittany, France. Gauguin started off landscape painting in the summer en plein air but following the creation of Vision After the Sermon he focused increasingly on interpreting religious subject matter in a highly personal way. Check out the full Wikipedia article about Vision After the Sermon.